While the Technology Strategy and Plan provide the guiding principles and priorities for technology management, a suite of Technology Management Processes are required to both CREATE the Technology Strategy and MANAGE the day-to-day tactical decisions based on that strategy. The successful integration of all these best practices and processes enables fact based decision making, optimizes efficiency and provides Technology Leadership with the levers and tools to manage technology in real time in line with the strategy. Technology Management is involved with the entire lifecycle of a product (offering) from idea to retirement and is principally responsible for balancing the portfolio of Technology development opportunities available in line with the business strategy. The relative size of the different buckets of technology investment (Pathfinding, Product Development, Product Support and Retirement) should support the overall business strategy. Processes within each stage are used to support the prioritization of development activity within each area against an appropriate set of criteria which should be different for each category i.e. Pathfinding vs. Support investments. The decision of where to invest involves more than just scoring individual projects against each other. In reality, investment decisions require the balancing and scoring of strategies or configurations of inter-related projects, often times from different business entities. 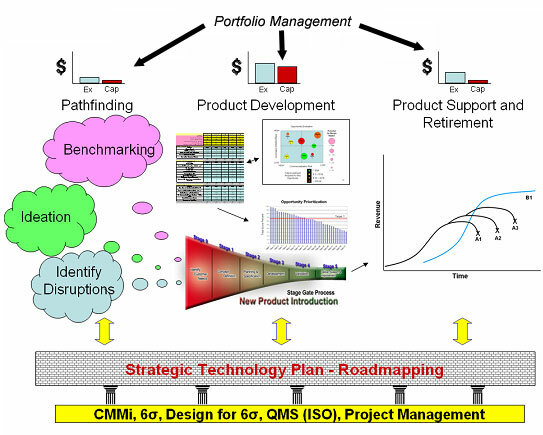 These strategies or roadmaps are the foundation of Strategy Driven Technology Management. Whalen Management Group has developed and implemented cross-functional, gated development processes which link customer requirements, through engineering design, to manufacturing launch. These processes include the necessary tools and methods to document and communicate between functions to ensure accountability and ownership at each stage in the evolution of a product under development. Utilizing process improvement methodologies like CMMi or 6 Sigma, in combination with certifiable Quality Management Systems ensures the organization is on a path to continuous improvement. Whalen Management Group can provide customized training modules for 6-Sigma Design tools and methods to ensure quality designs and verify that Customer Requirements are aligned in the Design of the Manufactured part. A strong foundation in Program Management to ensure rigorous execution of the plan is another key element to successful Strategy Driven Technology Management.